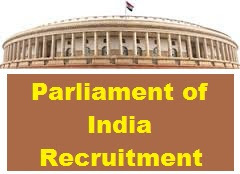 Parliament of India Recruitment 2017 has published on their official website loksabha.nic.in. Want to know more details? Here we have updated all information such as Syllabus, Age Limit, Eligibility Criteria, Exam Fee, Application Processes, Parliament of India Admit Card Date, Parliament of India Exam Date, Parliament of India Result Date details? Now you can check below. The Parliament of India is the supreme legislative body of the Republic of India. The Parliament is composed of the President of India and the houses. It is bicameral with two houses: the Rajya Sabha (Council of States) and the Lok Sabha (House of the People). The President in his role as head of legislature has full powers to summon and prorogue either house of Parliament or to dissolve Lok Sabha. The president can exercise these powers only upon the advice of the Prime Minister and his Union Council of Ministers. Age limit range: Applicant maximum age limit is 27 Years. The Upper age limit is relaxed by 5 years for SC/ST; 3 years for OBC, 10 Years for Persons with Disabilities (15 years for SC/ST PWD’s & 13 years for OBC PWD’s) and for Ex-S as per Govt. of India rules.